Site is powered by SASid, a trusted NAR partner who specializes in helping NAR members find the best insurance plans and products for themselves and their families. Do you have questions about the Affordable Care Act and would you like a visual demonstration of how NAR’s private health insurance exchange works? Online webinar Health Insurance and the Affordable Care Act: What REALTORS® Can Do Today, hosted by REALTOR® Magazine, answers important questions for real estate professionals. The webinar provides a short overview of the law, a brief summary of NAR’s insurance programs, and a walk-through of the REALTORS® Insurance Marketplace. A Major Medical Health Insurance Exchange offering Qualified Health Plans that meet the mandates of the Affordable Care Act (including HMOs, PPOs, High Deductible/Catastrophic Plans, and plans that qualify for Health Savings Accounts) through nationally recognized insurance carriers. Existing programs such as REALTORS® Core Health Insurance (a limited indemnity health insurance plan), REALTORS® Dental Insurance (providing coverage for preventive, basic, and major dental expenses with the dentist of your choice), and Drug Card America (a free discount pharmacy drug card offering savings on select generic and name brand prescription drugs at pharmacies nationwide). In accordance with the federal Affordable Care Act (ACA), as of 2014 almost all Americans who do not qualify for one of the existing government supported plans (such as Medicare or Medicaid) must have health insurance that meets a “minimum essential coverage” requirement, or potentially pay a penalty for non-compliance. SASid is here to provide guidance on selecting plans that meet the requirements of the ACA. Consultative advice and assistance. 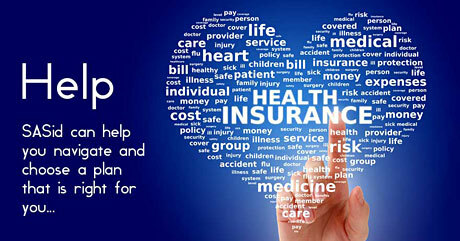 SASid representatives are available to personally consult and advise you on your individual insurance needs. They can help you navigate the healthcare insurance landscape and identify the products and plans that best suit the financial considerations and healthcare needs of yourself and your family. SASid representatives can also verify if the insurance you are considering, or currently possess, meets the Affordable Care Act threshold for minimum essential coverage. SASid develops technologies and online insurance products for top insurance carriers and nationwide distribution networks. Founded in 1999 by insurance professionals who have a passion to make insurance programs more simple and smart, SASid has been a leader and innovator in developing and marketing insurance on the web. SASid is located in Janesville, Wisconsin. Major medical plans available through the major medical health exchange are currently available in most states. Availability is subject to change. SASid is working to obtain approval in all states and territories. Members who have questions about coverage options are encouraged to contact SASid directly to learn more about the insurance offerings available to them, including state and federal resources..
Major medical plans available through the major medical health exchange are currently available in 42 states and the District of Columbia. Currently, major medical plans are not available in ID, ME, MA, MT, NM, RI, UT, VT, Guam, Puerto Rico, or the US Virgin Islands. Availability is subject to change. SASid is working to obtain approval in these states and territories. Members in these areas are encouraged to contact SASid directly to learn more about the insurance options available to them, including state and federal resources.